Middle grade books always get to me. Why? Because childhood and innocence are sacred to me and when injustices are done to either of these two precious things, it’s difficult to accept. Claire Legrand’s The Year of Shadows is not a walk in the park. It is not an action adventure that you can read on and off for a few giggles. This is a story of loss. Many losses. Olivia and her Nonnie and her maestro father have moved into the music hall because money is tight and they’ve had to sell their belongings. This is, of course, after Olivia’s mother left them about a year ago, having just given up on their life changing for the better. Olivia’s life is hard — practically homeless, lost cause of a father, senile grandmother, absentee mother, friendless, weird…all at 12 years old. And because of this, Olivia is a little punk. She’s abrasive, stone-cold, and desperately lonely. All she really wants are things to go right, and I feel that that was one of the things that kept gently snagging at me, gripping me. Such a simple wish. Olivia was an intriguing little thing; snapping at people with witty remarks, then simmering down to a whisper whenever she felt like crying but tried not to. She may come across as impressively mature for her age but then I think of children around the world dealing with such extraordinary circumstances and thought, no, never underestimate children. I think their ability to observe and absorb is one of the key elements of her characters. It’s part of what Olivia symbolizes. Understanding of life and the world is also portrayed in Henry and Joan. Henry has a secret, one that is just as dramatic and harrowing as Olivia’s but his path towards acceptance and moving forward is movingly admirable. And Joan, oh I can’t wait for you to meet Joan. Intelligent, strong-willed, and stubborn, she is comic relief in all the drama. I found these supporting characters thoroughly refreshing. Henry is one of the “populars” but for once (in any book I’ve read), he’s popular for a good reason. Not because he’s good-looking or rich but because he’s smart, talented, and not afraid to make decisions for himself. And Joan, who is pretty and rich, who, Olivia notes, would’ve been popular if she chose; except Joan chooses to be true to herself and her values and sod the student body if they think she’s a nut job. Applause! One complaint — not enough of either. As I mentioned, this book deals with some intense subject matter. The premise is that of a girl who meets ghosts who seek her help in “moving on”. This new representation of life and death, heaven, hell, and limbo is new to me. There is a twist in the legend of spirits being held back because of anchors keeping them tied yet powerless to the world of the living. It involves shadows and shades and portals to another dimension. But the ghosts and their stories. Of Tillie and Jax, and Mr. Worthington. Each of these individual stories is enough to threaten my tear ducts. They highlight suffering through actual dangerous and saddening moments in history. They were brief but Legrand’s expert writing goes straight through the flesh, the bones, and the heart. Perhaps a little more back story would be helpful for the younger readers who might not catch the signs as easily as an adult already familiar with the topic, but, nevertheless, it was effective. And that would probably be my only real criticism. This is very clearly a middle grade book written with an adult audience heavily weighing in the mind, which isn’t a bad thing. I say this because near the end, Olivia begins to deal with the concept of forgiveness, and while forgiveness isn’t necessarily a difficult idea to comprehend, the context in which it manifests is arguably mature. I just hope the children who pick this up — which I’m sure they will because it’s a great title and an awesome cover — will have just as a fulfilling experience as an adult would undoubtedly have. Good, though. Real good. Join us Monday for our stop on the official Year of Shadows Blog Tour! We have an interview for your reading pleasure, along with a giveaway of this beautiful hardcover. this sounds very interesting! Thanks for sharing! I hadn’t heard of this series before and I don’t usually read middle grade stories, but this one has captured my attention and I”m definitely going to be checking it out. I really loved her first book. It absolutely surprised me. Her writing style suited me so well I knew I’d continue t read books from miss Claire. I’m glad you enjoyed this one. I am extremely anxious to read it myself. I love the moody cover. Hahaha at Olivia being a little punk. It’s so true. I loved her for that, though. Middle grade MCs can be a bit Pollyanna-ish at times, like the one I’m struggling through right now. For some odd reason, I relate more to the bitter ones. Igor knows I was a bitter twelve year old. Henry’s a real learning curve for Olivia in a lot of ways. She learns about friendship, true, but also about the fact that you don’t have to let life get you down. Henry’s life has been terrible to him too, but he’s still friendly and loving. He’s really an inspiration. I do wish there had been more Joan. I feel like she falls by the wayside. Hmmm, I think all of the ghosty bits and the horror will keep kids engaged, even if they’re less enthused with the concept of forgiveness and that whole thing at the end. Though I am no expert on children. I hope so anyway. Wow, what a wonderful reply, Christina! I know what you mean about MG protagonists…without sounding mean, they can be a bit boring :/ I, too, love bitter, cynical, attitude, etc. I thought Henry and Joan were awesome. I was disappointed at how little there was of her. I thought she was like Olivia in that she had real edge, something that really impacts you as a reader even if its just comic relief. Not even, though, because I thought Joan would’ve made a great role model — minus the uptightness, haha! Even though I’m not the type to go for middle grade books, I think I’ll make an exception for this one. Beautiful review and ohhhh that cover is sooo pretty!! My goodness, this seems like a gorgeous and thoughtful story. I don’t read many MG books myself, but am always on the lookout for good ones to recommend my niece and my own kids as they get a little older. Thank you Andrea! I would recommend this as well as Legrand’s debut (which Wendy reviewed here). Also Laruen Oliver’s Leisl and Po. What a fantastic review. You really hit on all the main parts of the book without adding spoilers. I have had this book on my radar. I still hadn’t made up my mind about it until I read your review. It sounds like an emotionally impactful read which both young and old alike can appreciate. This is exactly the type of MG book I seek out to read. Great job reviewing this one with such attention to details. I’ve been hearing so many good things about this book! It’s one of the few MG books I might actually read. Beautiful review, K! Middle Grade books always seem to get to me, I haven’t read a dark MG so I think I’d start with this one. oh it sounds like a nice book, I didn’t know this one. But I love the cover. The cover is a beauty! I like MG but don’t get to read them as often as I’d like. Usually I gravitate towards the heavy, sad MG books so this one sounds like it’s right up my alley. Hopefully I’ll get to sneak a read in soon. I picked up this ARC at ALA and have been curious about it. Great review! I think this sounds like something I would really life to read. I don’t usually read MG sounding books, but this sounds really good! I love great supporting characters and these sound great..like you said, refreshing! Thanks for the fab review! I think my 8 year old granddaughter would like this book. I would have thought it was a little too upsetting for her if not for the book she brought home from school yesterday. It was about a little boy that died from leukemia and his family, so I think she would like to read this one. Lovely review, K! I’ve seen this book around a few times, but I’m not a big fan of MG books. This sounds like a truly thought-provoking and fantastic book. I’m glad you enjoyed it! Well, I hope you decide, on a day off, that you give this a chance. If not this, then perhaps Legrand’s debut? Good luck! I really love how this book made my heart feel like someone ran it over with a lawn mower. Great review! I’m glad you liked it! Phew, we agree, Lyn! Haha! Yeah, a lawn mower…yup. This sounds fantastic! I do love a good middle grade, though I rarely pick any up. Ooh, and that cover. So pretty, so intriguing. Olivia sounds like a fabulous little punk. I like the cover as well…only, I think Olivia actually looks too much like a boy :/ Other than that, I think it looks great! Legrand’s expert writing goes straight through the flesh, the bones, and the heart. Okay, I love you for OTHER reasons, too. But this is the main one. I’m quite intrigued by this one. MG books don’t work for me since I’m usually interested in topics that apply to teens or adults, but I love the sound of this one. I definitely think I’ll have to give it a try. Great review, K! I think a lot of children’s lit are infused with substance for adults since, you know, parents typically read the books to their children. We can’t leave them out of the equation ;) I hope this exceeds your expectations, Keertana. I think I need to add this to my to be read list. Sounds great! Heavy, but great. I just picked up Cavendish for my Kindle and I’m so excited to read it! 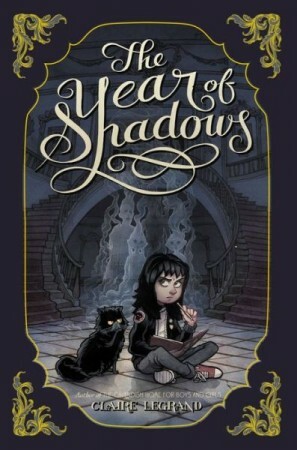 If The Year of Shadows is a good as all the reviews I’ve seen for Cavendish then there’s no telling how far Legrand’s literary prowess is going to take her and I just want to be there to soak up as much of it as I possibly can! I can’t wait to read Cavendish. Honestly, I think that book would actually be more along my taste. So yay! I have yet to read a Claire Legrand even though I love Middle Grade… I really want to read this one though it sounds wonderful. Good to know it works well for adults too. I’ve picked up several MG books this year that didn’t crossover to adults very well at all… lovely review! Sorry to hear your disappointment, Bonnie. I hope this one lives to your standards. I’ve been curious about this one, especially since Legrand’s first novel was so popular. It’s interesting that it seems to have an adult POV in mind as well as that of its intended audience. Its not really adult pov, it was just a little mature for a 12 year old…unless I was just a dumb 12 year old. Oh yes. There are good messages to be had from this one. Plus its fun. I love middle grade books and this one sounds like a really great one. The characters sound fabulous, and the story does too. I have been wanting to read this one since I first heard about it. I’m glad that you enjoyed it. Great review! Thanks Amy. I love MG books too and this one doesn’t disappoint.